This Tudor Revival-style home was built in 1915 by Stephen Gerrard, who was known as “the Cantaloupe King.” He was a truck farmer who built an empire by shipping cantaloupes from Colorado to the Midwest in refrigerated railroad cars. He went on to invent the refrigerated truck and popularize iceberg lettuce in the U.S. When the Great Depression hit, Gerrard’s empire collapsed and the house sank into disrepair. It was abandoned for 13 years in the 1970s and ’80s, but rescued in 1989 by the current owners. The grand old house was riddled with termites when they found it, and they estimate there were at least 100 cats living there. Their renovation efforts earned them a merit award from Better Homes and Gardens. 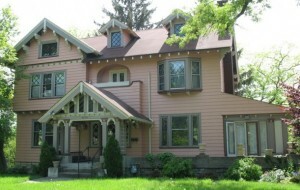 The Gerrard House sits on the highest point of the North Avondale Ridge. It has 15 rooms and 7,000 square feet. 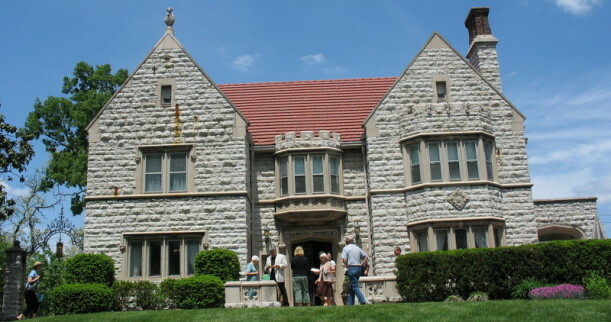 The walls are rock-faced limestone, and gargoyles, gables, and elaborate chimneys evoke the Tudor Revival style. Iron gates guard the entrance. Wow that house is way to made up for me! I can’t imagine trying to be cozy around a fireplace with 3 wingbacks and a small loveseat! I do love the architecture though. I would have loved to see the kitchen with all the tile – I’ve never seen anything like that. Wow, that interior is something else! Beautiful architectural details! I love it! I would love to see a picture of the kitchen with all of the subway tile. If you can ever take or get one please post it! What a house by the way! I will, Steve! The kitchen was really small and pretty much as it was originally, although they squeezed a refrigerator in there and added a ceiling fan (which frankly looked ridiculous with the subway-tiled ceiling). The Cantaloupe King was all about refrigeration, so he had an entire refrigerated room like you might find in a restaurant or grocery store where they stored their food. Somewhere along the line the walk-in ice-box was converted into a breakfast room with a built-in banquette. Has anyone ever had a kitchen with a tiled ceiling like that? Or even seen one? I would love to track down a photo of an old kitchen similar to this one if not the actual one. I’d love to see the kitchen. It sounds pretty nifty. I like the music room. Love the woodwork in this house. Try looking for pictures of biltmore house in asheville. I think I remember a tiled ceiling in it. If no in the kitchen try the indoor pool room. This has been so much fun…I would have loved to have spent the day with you strolling these beautiful mansions. And, I even would have been a nice enough new friend to tell you that you had a chunk of chocolate on your leg! That is hilarious! Can’t wait to see the biggest and grandest tomorrow! I showed a house with a tile kitchen, including ceiling, about 14 years ago. The house was built in th early 30s. A great idea to be able to clean the ceiling, but it was a not particularly pleasant shade of green and I am sure whoever bought the house removed it long ago. being the one to have to dust! Yuck! My college dorm was Tudor Revival and I was lucky enough my freshman year to have the room over the front entrance, with a carved bay window and a window seat. It was the perfect spot to view everything going on down on the main lawn.